Ultrasonic waves carry information about the fluid flow rate as they propagate through the flowing fluid. Therefore, the flow rate of the fluid can be detected by the receiving ultrasonic wave, and converted into a flow rate. 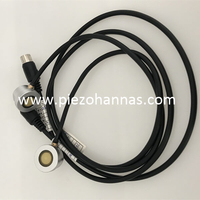 According to the detection method, it can be divided into different types of 1MHz ultrasonic flowmeter transducer such as propagation velocity difference method, Doppler method, beam offset method, noise method and related method. There are many types of ultrasonic flowmeters, which can be divided into different types of ultrasonic flowmeters according to different classification methods. 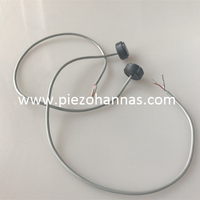 In addition to the way of detection, there are also probe (transducer) of installation methods, according to the number of channels, according to performance and the application. At present, two types of ultrasonic flowmeters are generally used, one is a doppler ultrasonic flowmeter, and the other wall mounted ultrasonic flow meter is a time difference ultrasonic flowmeter. The Doppler type uses the phase difference method to measure the flow rate, that is, the sound wave of a certain frequency moves in the fluid. Since the liquid itself has a moving speed, the frequency or phase of the ultrasonic wave between the two receivers (or the transmitter) occurs. Relative change of the liquid velocity can be obtained by measuring this relative change; the time difference type is to measure the flow velocity by using the time difference method, that is, the sound wave of a certain speed causes the propagation time between the two receivers (or the transmitter) due to the fluid flow. Changing by measuring this relative change, the fluid flow rate can be obtained. Most of our factories use time-lapse ultrasonic flowmeters. The following briefly introduces these two types of ultrasonic flowmeters and specific measurement methods. 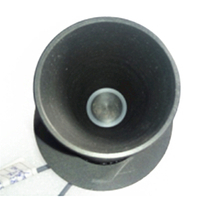 Doppler ultrasonic flow meter sensor: The transducer emits an ultrasonic signal with a frequency of f1. After passing through suspended particles or bubbles in the liquid in the pipeline, the frequency shifts are reflected to the transducers at a frequency of f2. That is, Doppler will have the difference between f2 and f1 is the multi-spectral frequency difference fd. Let the fluid flow rate be v, the ultrasonic sound velocity be c, and the Doppler frequency shift fd be proportional to the fluid flow velocity v, that is, when the pipeline condition, the transducer installation position has the transmission frequency, and the sound velocity are determined, c, f1, and θare constant. The fluid flow rate is proportional to the doppler shift, and the fluid flow rate is obtained by measuring the frequency shift, thereby obtaining the fluid flow rate. The working principle of the Transit Time external ultrasonic flowmeter transducer is shown. He is an indirect measurement method that uses a pair of ultrasonic transducers to alternately (or simultaneously) transmit and receive ultrasonic waves, indirectly measuring the flow velocity of the fluid by observing the smooth and countercurrent propagation time difference of the ultrasonic waves in the medium, and calculate the flow rate by the flow rate. 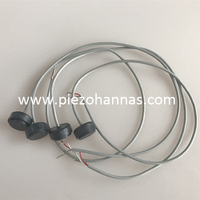 There are two ultrasonic transducers: a forward-flow transducer and a counter-current transducer. The two transducers are respectively installed on both sides of the fluid pipeline and at a certain distance. 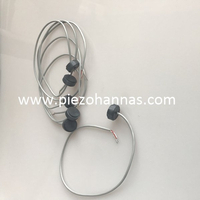 The inner diameter of the pipeline is D, and the path length of the ultrasonic walking is L, the ultrasonic flow rate is tu, the countercurrent speed is td, and the ultrasonic wave propagation direction and the fluid flow direction are angled by θ. Due to the fluid flow, the time taken for the ultrasonic wave to propagate the length of the L length is shorter than the time taken for the countercurrent propagation, and the time difference can be expressed by the following formula: The above is the basic principle of measuring the flow rate by the time difference method. In practical applications, depending on the installation method of the ultrasonic transducer clamp on flowmeter, it can be divided into a clip-on type (the steel strip for the transducer is fixed and glued to the outer wall of the pipe with a coupling agent,they are not in contact with the fluid) and the contact type (ultrasonic transducer) Installed on a section of a spoon, the transducer is in direct contact with the fluid being measured.